You haven’t heard from me for a long time. It can be good to take a break from reviewing productivity apps and to focus solely on Getting Things Done®. For me, that has meant a new landmark project: I am currently working on my debut novel, and I am well into my first draft. Let me tell you what that means to me. I started writing when I was nine years old (poetry, short stories) and I have written—mainly in a professional capacity—ever since. Reports, manuals, school books, briefings, speeches, websites, literary criticism, e–learning modules—you name it. Scrivener has been made by people who understand writing. Thoroughly. They understand focus. They understand the balance between structure and flexibility, between detail and overview. They understand the importance of research. No wonder their app is a joy to use. But let’s take a step back. Scrivener’s makers, the folk at Literature and Latte, describe the application as ‘a powerful content-generation tool for writers that allows you to concentrate on composing and structuring long and difficult documents.’ Scrivener used to run only on mac operating systems but they recently put out a version for windows. 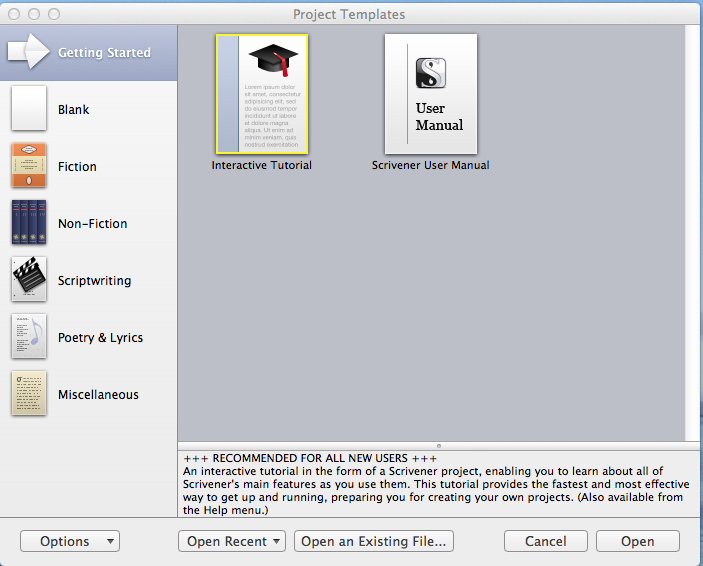 Scrivener is a sophisticated writing application that comes with a range of templates. Only $45 US to purchase; runs like a dream, backs up to dropbox. If you don’t want to take my word for it, you can download the trial version and judge for yourself. This review is of version 2.2 for mac, which I have run on leopard, snow leopard and lion. When you first fire up scrivener you see a rather modest looking workspace in which a tutorial and an extensive manual figure prominently. The navigation pane on the left offers templates for fiction and non-fiction, scriptwriting, poetry and lyrics. 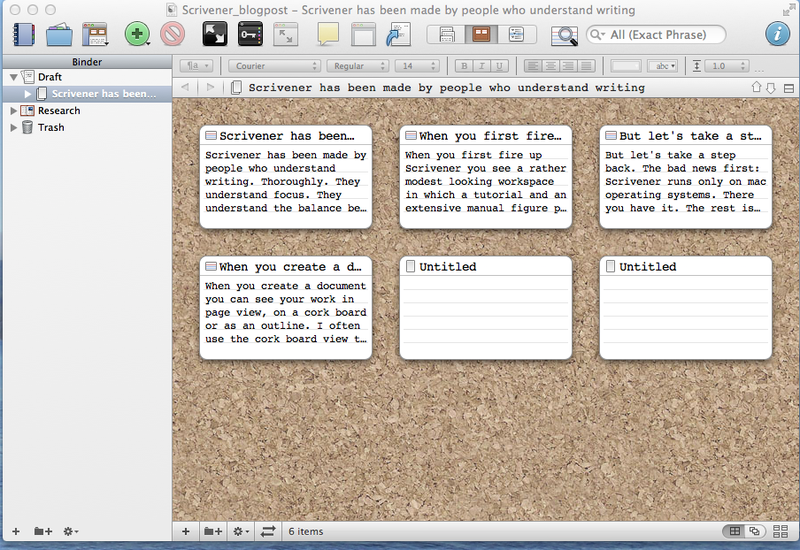 The Scrivener opening screen. 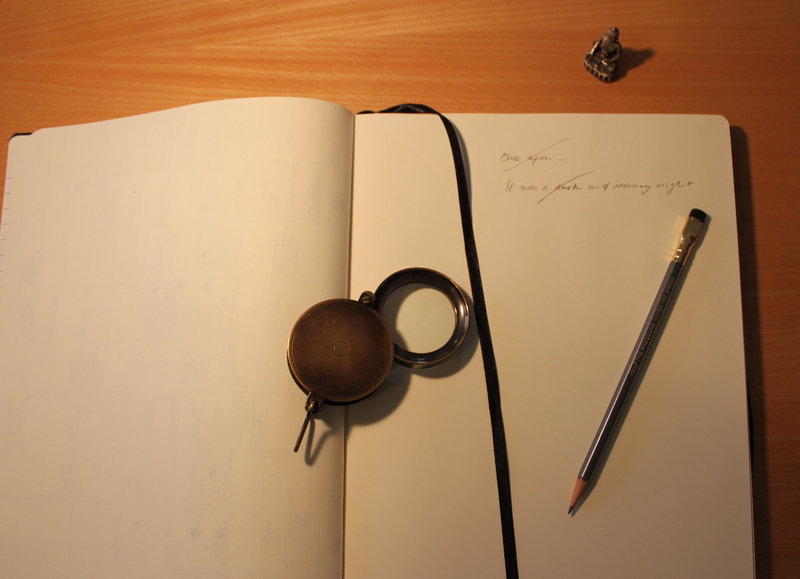 Not much by way of eye candy here, but a robust and versatile writing tool. When you create a document you can look at your work in page view, on a cork board or as an outline. I often use the cork board view to start off work papers or blog posts. It allows you to explore uncertain content, tentatively drafting paragraphs and playing with their order by moving index cards around on the screen. It is a very visual and almost tactile way of working. Go on, move those paragraphs! Long live drag and drop. I mainly use scrivener for working on my novel and there I normally work in outline view if I want to tinker with the structure. 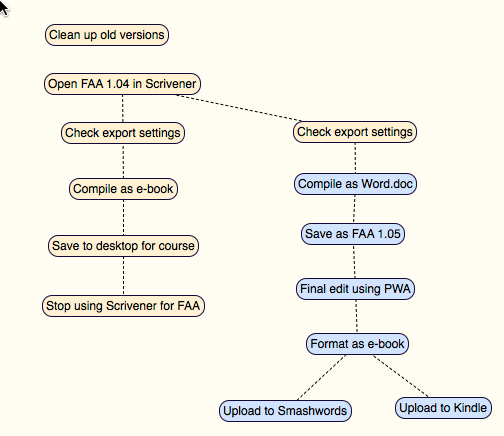 It is very easy to set up a hierarchical structure where every chapter gets its own folder. The individual scenes are separate documents within that folder. Character notes, ideas, notes, scenes and chapters can all be colour-coded and tagged with metadata such as date created or revised and the number of words. When I work on a scene I sometimes keep two navigation panes open. The one on the left of the screen lets me keep the structure of my novel in sight, a bit like a fun version of windows explorer; the one on the right shows my synopsis of the scene I am developing and provides a notes section. These notes are handy because I keep being surprised about the number of continuity issues that arise as you start writing a novel. And this is my first attempt, by the way; I am a total rookie, a noob. At times, however, you do not want to see anything other than your text and then scrivener lets you switch to a full screen view where, apart from the text, everything else is blacked out. Even this is done cleverly, as a sliding menu bar at the bottom of the screen lets you adjust the density of the background and the width of your paper. Scrivener also provides templates for describing the characters and places that figure in your novel. At first I thought this would be overkill. This was, after all, a moderately wild and creative project; not a dour project brief. Hm, have I said I was a newbie? Did I mention continuity issues? After only a couple of scenes I found some characters all of a sudden being ten years older than I had envisaged, or living in a different suburb than the one mentioned before. 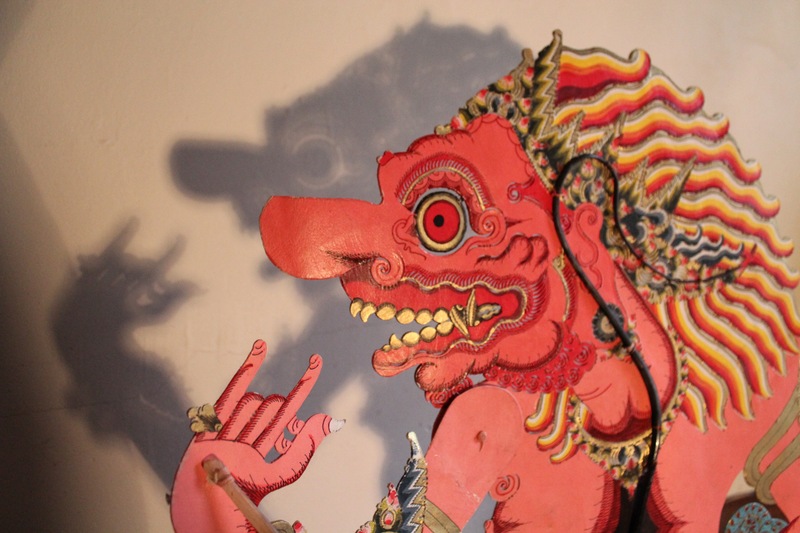 I realised, in a very concrete way, that writing fiction involves not only creating credible characters, but also determining the complex interplay of their preferences, habits and relationships that underpins the narrative. That is when I swallowed my pride and returned to developing those backstories. Writing and outline views, you may say – can’t you do all of that in word or pages? Sure, but scrivener offers so many other features. There is a research folder for storing all notes, images and web clippings related to your project. One of the most compelling features for me is the capacity to split the editor in order to view two passages side by side, within the same document. This enables you to check, for example, whether you have used the same phrase or image twice in describing a minor character, or whether you have unwittingly changed that malcolm character from a beefy rugby playing real estate agent to a quiet librarian with a goatee. You can also set yourself a target and scrivener will obligingly nag you if you do not attain the requisite number of words. I get hassled enough about timelines as it is, so I pass on that feature. It might be a life-saver, though, if you use scrivener for essay or dissertation writing. When your text is ready, scrivener will compile all your separate documents into a single manuscript for final formatting, submission to an editor or e-book self-publishing. So any improvements? I am still smitten with this software and cannot think of any at this stage. Suggestions? Sure, how about an ipad version? Feel free to lobby the people at literature and latte, who brought you this fantastic app. Must go; I have a novel to write. Wish me luck.